I had not recognized before teaching this class how much game design is essentially an experimental process. Our textbook calls it an "iterative process," which essentially means trying it again and again until you get it right. Basically, you can imagine all sorts of rules in a game, but until you try it out you really cannot know how it will "play." That's because games are essentially complex systems, so changes in even a single rule (however minor) can have all sorts of unpredictable ramifications -- sort of like the idea of a butterfly affecting the weather. Last class, my students brought in their designs for 8x8 games using the pieces of a checkers game (or whatever additions they wanted to provide). I asked them, by a show of hands, how many had actually tested their designs by playing them. Fewer than 1/4 of the class had done so, which did not surprise me. And so I was also not surprised to find that their groups had a lot of trouble making any one of their designs work -- or, as was the case with one group, they very quickly latched onto the only game concept that anyone had actually tried out ahead of time. 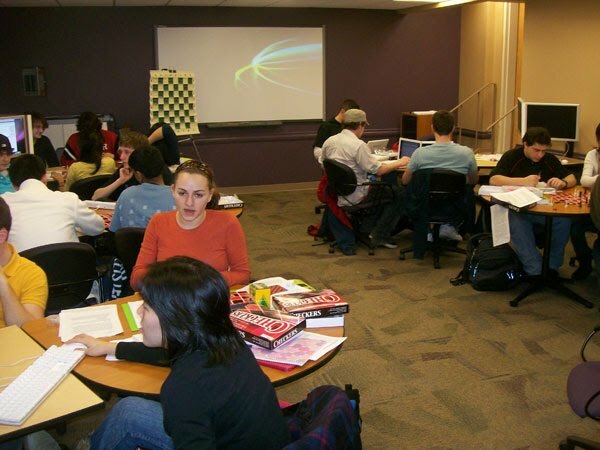 The interesting thing, though, was that most of the class period was spent trying out their games, and trying to get them to work through collaborative play and experimentation. If they learned nothing else from today's class, then, it was the importance of play testing! 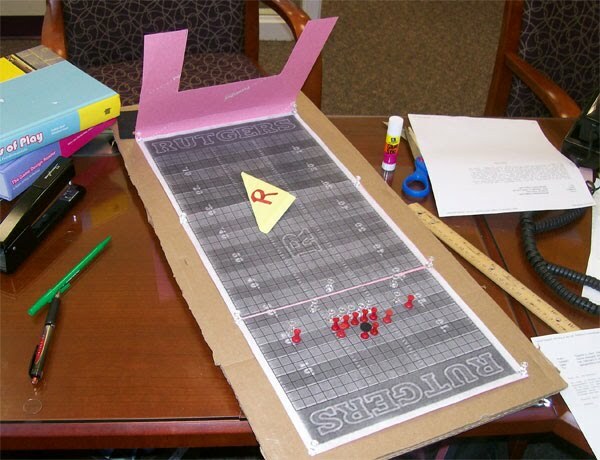 I have been learning the value of play testing myself, first hand, as I try to develop my "Rutgers Football: The Board Game" concept. Initially, I had tried to make it work as an 8x8 game, but in playing it a bit with my nephew we quickly realized that something had to change. Either we needed a much bigger field or we needed fewer pieces -- something more akin to a backyard pickup game than a full-blown eleven-man squad. At first I tried a 10x20 game board, but I also found that too small for 11 pieces. The working prototype turned out to be 20x40 -- or 800 squares! If you had told me when I started that the game would have to be that big to work like football, I would not have believed it. But the more I actually looked at the scale of a football field (which I did quite a bit searching for football field images), the more I realized that the game of football itself takes place on a gridiron of an even larger scale. I have still not settled on all the rules of the game -- but I also have not played it enough to know what it really needs. I do, however, have a fully functional and playable prototype so I can keep modifying and improving the rules. And I can try it out on other people. I was most proud of the game board, which I will eventually print out in color and on a larger scale than the black and white prototype I've put together. The way I made it is that I found an image online showing the Rutgers stadium field from above -- but at an angle -- and had to play with the "Edit">"transform">"skew" feature of Adobe Photoshop to get it to look like a bird's-eye view (above). I then added a custom grid to the picture -- creating a "custom pattern" on a transparent background, then stretching it over the image of the field I had created. I was surprised at how quickly the whole thing came together, though it took a lot of experimentation and prototyping -- just like creating the game itself. I then cut the image into three parts and pasted it into Word to create a three-page PDF for easy printing and sharing. 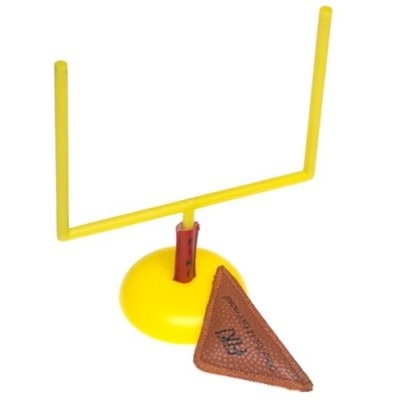 I am waiting for the Fiki Football goal posts and balls and the green and black "Football Guy" plastic players I've ordered from Amazon before I generate the final prototype. I suppose I'll have to research ways of dying plastic plastic pieces red. But, if the game is playable, I'm very close to having everything I need for the final prototype. Then the real fun of promoting it begins... But at least my students can learn from my experiences -- as well as from their own.